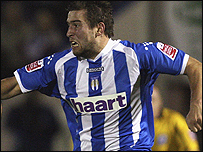 Colchester United have released another three players as they prepare for life in League One. Defenders Adam Virgo and Bela Balogh will return to their parent clubs after long-term loans and Danny Granville is on his way after one year with the U's. Another four players - Kevin Watson, Luke Guttridge, Tom Devaux and Tom Webb - were told they would be released from Layer Road last week. Striker Teddy Sheringham and goalkeeper Aidan Davison have now retired.